Alauddin Khilji was the sultan of Delhi. 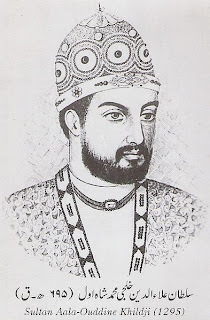 He was the second sultan of the Khilji dynasty and was the most powerful king of this dynasty. He ruled for about twenty years from 1296 to 1316. He became the sultan of Delhi after killing his uncle and father in law Jalal-ud-Din Khilji, the founder of Khilji dynasty. He was a very ambitious person and a warmonger. He liked to call himself ‘The Second Alexander’. He took the title ‘Sikander-i-Sani’. During his regime he expanded his kingdom to a large area. He conquered Gujarat, Ranathambor, Mewar, Malwa, Jalore, Warangal, Mabar and Madurai. He is also famous in history for defeating the Mongals many times. He won against the mongals in the battles of Jalandhar (1298), Kili (1299), Amroha (1305) and Ravi (1306). Behind the success of his war strategies was a slave called Malik Kafur. He discovered Malik Kafur during the conquest of Gujarat. Malik Kafur was a powerful Army Chief. He helped Alauddin to conquer many states. Alauddin Khilji died in 1316. It is believed that Malik Kafur murdered him. Gujarat Conquests Gujarat was a wealthy state at that time. They had a good trading relations with the Arabs and Persians. Alauddin Khilji sent the generals Ulugh khan and Nusarat Khan to conquer Gujarat. King of Gujarat Karna Dev Vaghela fled with his daughter. His wife became queen of Alauddin. Slave Malik Kafur was released and later he became army chief of alauddin. Ranathambor Conquests Alauddin conquered Ranathambor form the Hamir Deva in 1301. Chittor Conquests In 1303, he attacked Chittor. At that time Rana Ratan Singh was the king of Chittor. There is a story that alauddin attacked chittor for the queen Padmini. Though there is no proof of this story. Conquest Of Malwa Mahlak Dev was the king of Malwa at that time. Mahlak Dev was killed in a bloody war. Conquest of Southern India Malik Kafur helped him to conquer Southern India. He acquired Yadava dynasty of Devagiri, Kakatiya kingdom of Warangal, the Hoyasala dynasty of Dwarasamudra and Pandyas of Madurai. He was the first muslim king to conquer Southern Indian continents.